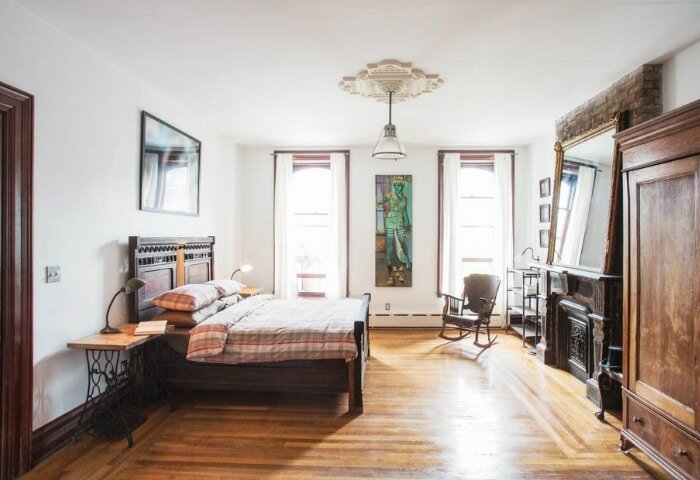 A renovated, vintage- and industrial-inspired boutique guesthouse & inn located in the heart of Hudson, New York. A charming, lovely place to stay during your upstate getaway. This autumn the Hudson Milliner Guesthouse & Inn opened as a refuge for urbanites in search of refined comfort in classical surroundings. One step inside the newly-renovated 19th century hat shop transports the present to an ageless luxury designed to captivate time. The refined details of each room heighten the awareness of precious moments passing into a weekend of bliss accompanied by the innumerable pleasures of the modern world. restored fixtures such as vintage electric and gas stoves and refrigerators. 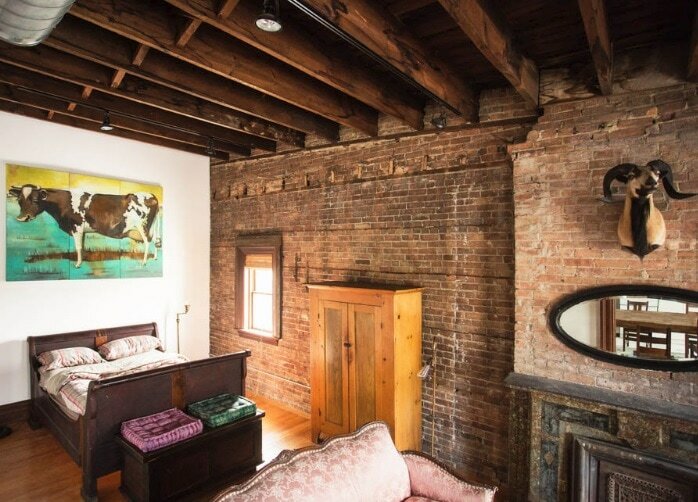 Two bedrooms with accompanying kitchen and bathroom with high 14' ceilings, exposed brick walls and hardwood floors. The Top Hat had been furnished with early industrial furniture and repurposed antiques to reflect Hudson's promise as a destination with purpose. The private kitchen includes working early vintage electric stove and antique refrigerator. The private bathroom with hexagon tile floor and subway tile walls has been renovated to combine 19th Century charm with a modern spacious walk-in shower. The Top Hat's 700 square-feet offers spacious accommodations with central air conditioning, high speed internet, sound tower and access to a washer/dryer. Facing Warren Street's beautiful antique shops, art galleries and cafes, the master bedroom has a stunning antique roll-top desk providing the perfect setting to writing a novel you've been putting off all these years. 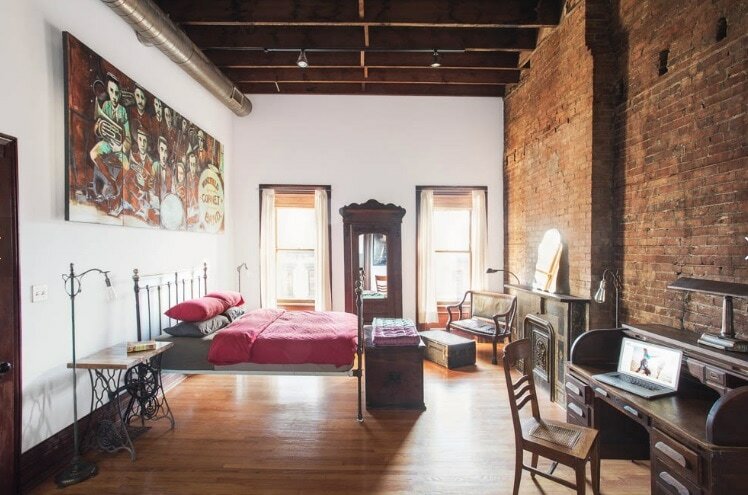 The Bowler offers a high-ceiling bedroom with a sumptuously sleepable sleigh-bed set in a space with high ceilings, exposed ancient wooden beams and antique brick walls dropping to polished hardwood floors. The Bowler's spacious private kitchen has a vintage gas stove - a 1910 Champion - and refrigerator - a Kelvinator – along with a solid antique wooden table sitting eight for lovely sunset dinners and late morning brunches. If you're serious about cooking, then The Bowler is the place to stay. The private bathroom houses a beautiful old clawfoot tub and sink. The accommodation's 650 square-feet allows guests to entertain friends in spacious comfort. As with all the Hudosn Milliner's rooms the Bowler includes central air conditioning, high speed internet, sound tower and access to a washer/dryer. The Fedora is a jewel with a single bedroom, kitchen, huge bathroom and a large walk in closet. Afternoon sun floods onto the hardwood floors of the bedroom until sunset. The spacious kitchen has an antique 40's gas stove and a canary yellow 50's Philco fridge. The refurbished bathroom remains true to the Hudson Milliner's Guesthouse's vintage style with hexagon tile floor and subway tile walls. Relaxation is guaranteed from a long bath in the oversized antique claw foot tub accompanied by two large porcelain sinks with modern shower and sink fixtures. The Fedora includes central air conditioning, high speed internet, sound tower and access to a washer/dryer. With its generous layout, the Fedora is a jewel of a space, larger than most New York City apartments. with a stunning view of Hudson's architecture, galleries, antique stores, and cafes.